UPDATE: The video was taken down by Google within 48 hours of posting on MTP. The media wing of al Qaeda in the Arabian Peninsula (AQAP), al Malahem Media Foundation, released an audio message on Twitter [and on YouTube] in late January featuring AQAP ideologue Ibrahim al-Rubaysh titled “Allah Will Be Sufficient For You Against Them.” In this most recent eight and a half minute message, Rubaysh addresses the surge in solidarity for the victims of January’s attack on the satirical French Charlie Hebdo magazine, an operation which AQAP has since claimed…. He advocates increased attacks as a way to push Westerners to abandon their faith in freedom of speech “if that means offense of the Muslims.” He suggests that if Western countries truly understood that such offenses against Islam would cost them a heavy price, they “would legislate laws” to prevent and deter people from offending Muslims. Rubaysh concludes his audio message with a general call for attacks against anyone disrespectful of Islam. “Oh Muslim, oh you who loves the Messenger of Allah (PBUH): set forth to Allah’s blessing,” he says, a clear invitation to jihad. He adds that Muslims should “not consult anyone about killing one who mocks the Messenger of Allah (PBUH)” and not heed the words of Muslim clerics who do the bidding of earthly rulers. If you have any doubt that these videos act as recruiting tools for jihad, I suggest you sample the comments. Oh, and use that handy Google Translate bar embedded in each comment. Ibrahim al-Rubaysh the spiritual leader of Al Qaida in the Arabian Peninsula (AQAP), who was held in extrajudicial detention in the United States’s Guantanamo Bay detention camp in Cuba, then escaped after repatriation to Saudi Arabia in 2006. Here’s a cute video from YouTubeistan of Code Pink conducting a reading aloud of “Ode to the Sea by Guantanamo prisoner Ibrahim al Rubaish“. The YouTube channel partner is “مجا هد” which roughly translates into “mjd” short for..you guessed it…mujahid, or a fighter for jihad. I’m sure if you asked anyone at Google whether the company provides material support for terrorists in violation of U.S. law, they’d probably deny it and be genuinely horrified, or they’d come up with the usual Googlely excuses that they take down videos that are offensive to “the YouTube community” or some such hogwash. 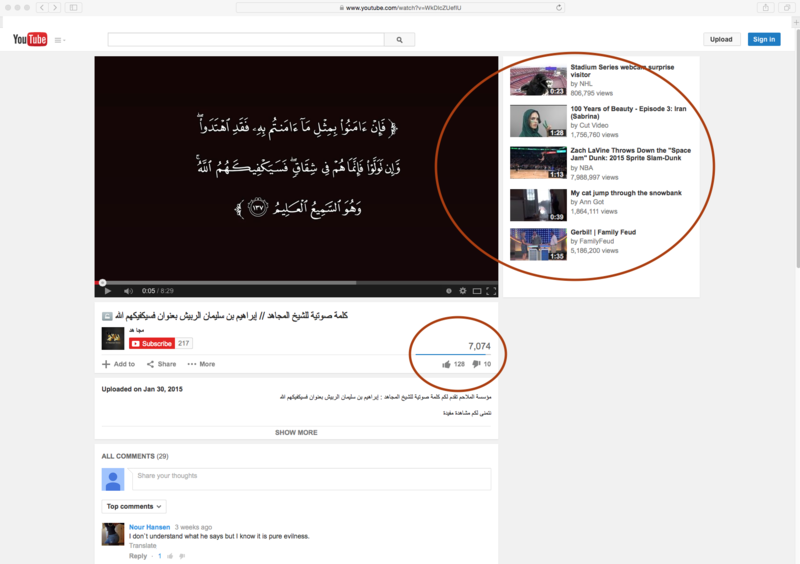 For in YouTubeistan, jihadi recruiting videos are very popular. The French interior minister said Friday he asked Google, Facebook and Twitter to work directly with French officials during investigations and to immediately remove terrorist propaganda when authorities alert them to it. “We emphasized that when an investigation is underway we don’t want to go through the usual government to government channels, which can take so long,” said French Interior Minister Bernard Cazeneuve after a meeting with representatives from the U.S. tech giants…. Twitter and Facebook spokespeople said they do everything they can to stop material that incites violence but didn’t say whether they would heed the minister’s request for direct cooperation with French authorities. When asked whether Twitter would work closely with French investigators, a spokesperson said their website outlines the guidelines for law enforcement to request information. “We review all reported content against our rules, which prohibit direct, specific threats of violence against others,” the spokesperson wrote in an email. An email to Google requesting comment was not immediately answered. Do you think that parents know that these videos are available to their children who are watching YouTube? How about schools, businesses, government agencies that allow YouTube in their premises? Not to mention the National Hockey League, the National Football League or Ann Got’s cat video being cross-promoted with a link to AQAP? Not to mention the “bad acts window”–that period of time between when YouTube allows a video to be posted and when it is removed for whatever reason. 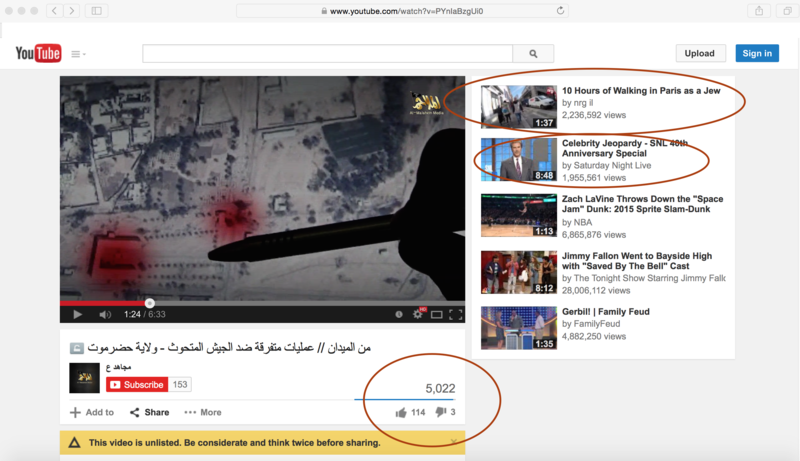 For example, this jihadi video that Google ultimately removed (a couple of times) had over 7,000 views and another video we recently flagged had over 5,000 views in a 48 hour period. Does that seem like a lot? Given the message and potential risk to the public, who should get to decide? Google? The fact is that Google has built a product that has some beneficial features but has deep design defects. And like everyone else who manufactures a defective product, they’re keeping it very quiet. This line of inquiry is exactly what is at issue in Mississippi Attorney General’s subpoena against Google. And I think this is exactly why Google is so hell bent on keeping investigations far, far away from YouTubeistan. But you know–if you see something, say something. This line of commentary from MTP is incredibly illuminating. I hope it gets the wide audience it deserves.